Definition at line 34 of file CQFluxModeDM.h. Definition at line 25 of file CQFluxModeDM.cpp. Definition at line 40 of file CQFluxModeDM.cpp. Definition at line 53 of file CQFluxModeDM.cpp. References COL_REACTION_EQUATION, COL_REACTION_NAME, COL_REVERSIBILITY, COL_ROW_NUMBER, FROM_UTF8, CEFMTask::getFluxModeDescription(), CEFMTask::getReactionEquation(), mBeginModes, mpTask, and rowCount(). Definition at line 45 of file CQFluxModeDM.cpp. Definition at line 112 of file CQFluxModeDM.cpp. References COL_REACTION_EQUATION, COL_REACTION_NAME, COL_REVERSIBILITY, and COL_ROW_NUMBER. Definition at line 170 of file CQFluxModeDM.cpp. Definition at line 182 of file CQFluxModeDM.cpp. Definition at line 176 of file CQFluxModeDM.cpp. Definition at line 32 of file CQFluxModeDM.cpp. Definition at line 163 of file CQFluxModeDM.cpp. Definition at line 148 of file CQFluxModeDM.cpp. 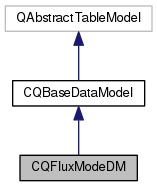 Definition at line 60 of file CQFluxModeDM.h. Definition at line 61 of file CQFluxModeDM.h. Definition at line 59 of file CQFluxModeDM.h.